Tony Stark (Robert Downey Jnr) is the egomaniac head of Stark Industries, a multinational corporation that deals with a variety of technology, including arms dealing. In Afghanistan, after demonstrating the power of a new weapon to potential buyers, Stark is captured by a terrorist group who want him to build the weapon for him in a cave. In the capture, he is wounded by shrapnel which has left large amounts of metal in his body, and a fellow captive has created a powerful magnet to keep the scraps from entering his heart and killing him. Instead of building the weapon, he improves the magnet so it is self-powered and builds a suit of iron – the first stage of Iron Man. Escaping and returning to the US, Stark removes arms sales from his company, causing share prices to drop. His passion becomes using his technology for good, but he has powerful enemies who are not happy with the path he is taking. Iron Man is a great action film, with lots of explosions and big fights combined with humour and the delightful charisma of Stark. Of course, as all good action films should, it leads up to a massive battle between Stark and his nemesis. Coming back in Iron Man 2, Stark has outed himself to the world as a superhero, and this has brought the wrath of Ivan Vanko (Mickey Rourke) the son of a Russian scientist who worked with Tony Stark’s father in the fifties and sixties. Vanko wants revenge and uses the same technology that Stark possesses to create great big huge electrical whips – big enough to cut a car in half during the Monaco Gran Prix. The US government wants to own the technology that Stark uses for his Iron Man suit to create an army, but Stark refuses to sell, even after a formal governmental enquiry. Justin Hammer (Sam Rockwell) is an arms dealer who wants to develop Iron Man suits, and manages to get Vanko on board. Unsurprisingly, Vanko does not share the vision of Hammer, and a massive battle ensues, with Stark paired up with his army contact Lt. Col. Rhodes (Don Cheedle) to fight the final battle. This second film takes the fight sequences to a ridiculous height, and I loved every moment of it. 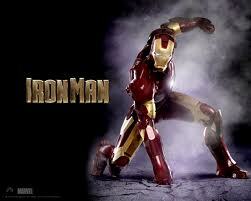 I believe there is a third Iron Man in the making, and I can’t wait. Even with Gwyneth Paltrow totally miscast as Pepper Potts (and I’m a Paltrow fan, I just didn’t buy her in this role) it was a wonderful and ridiculous piece of cinema. Hang about until the end of the credits to see the teaser for another Marvel flick.